The sound you heard when this page opened was a colony of bats. Is that what you're hearing in your home? The certified bat removal technicians at Tampa Bay Bats have been removing all species of Florida bats and colonies from commercial & residential properties both interior and exterior in west and central Florida for over 12 years. We do not harm the bats, as they are a designated "beneficial species" in Florida. Instead, we have methods of coaxing them into leaving, or just preventing them from re-entering. We offer the latest, most humane methods for excluding the bats from any structure, even a belfrey, if you have one. Once we rid your home or commercial structure of bats, we will block or "exclude" the way in, and offer to clean up the disease and parasite rich areas of infestation. Call Tampa Bay Bats to have the job done right in Tampa, Orlando, Sarasota or any place in between. Nobody knows bats better than Tampa Bay Bats. 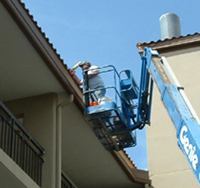 We are fully Licensed and insured to handle all of your needs. If you're experiencing any other wildlife problems, please click here to visit our Nuisance Wildlife Removal, Inc. website for more details. Please call us for your safe & humane bat removal solution. Tampa Bay Bats is dedicated to increasing awareness about bat species and their conservation in Manatee, Sarasota, Charlotte, Hillsborough, Pinellas, Polk, & Lee Counties: Alturas, Alva, Anna Maria, Apollo Beach, Auburndale, Babson Park, Balm, Barefoot Beach, Bartow, Bay Pines, Belleair, Belleair Beach, Belleair Bluffs, Belleair Shores, Boca Grande, Bokeelia, Bonita Springs, Braden River, Bradenton, Bradenton Beach, Bradley, Brandon, Cape Coral, Cape Coral Central, Cape Coral South, Captiva, Carrollwood, Champions Gate, Clair Mel City, Clearwater, Clearwater Beach, Cortez, Cresent Beach, Crystal Beach, Cypress Gardens, Davenport, Davis Island, Dover, Dundee, Dunedin, Durant, Eagle Lake, Eaton Park, El Jobean, Ellenton, Eloise, Englewood, Estero, Fedhaven, Florence Villa, Fort Meade, Fort Myers, Fort Myers Beach, Frostproof, Fruitville, Gibsonton, Grove City, Gulfport, Haines City, Highland City, Holmes Beach, Homeland, Indian Lake Estates, Indian Rocks Beach, Indian Shores, Kathleen, Kenneth City, Kissimmee, Lake Alfred, Lake Hamilton, Lake Wales, Lakeland, Lakeshore, Lakewood Ranch, Largo, Laurel, Lehigh Acres, Lithia, Longboat Key, Loughman, Lutz, Macdill Air Force Base, Madeira Beach, Mango, Matlacha, Matlacha Isles, Miromar Lakes, Mulberry, Murdock, Myakka City, Nalcrest, Nichols, Nokomis, North Fort Myers, North Port, North Redington Beach, Northdale, Odessa, Oldsmar, Oneco, Osprey, Ozona, Palm Harbor, Palma Ceia, Palma Sola, Palmetto, Parrish, Pass A Grille Beach, Pinecraft, Pineland, Pinellas Park, Placida, Plant City, Poinciana, Polk City, Port Charlotte, Punta Gorda, Redington Beach, Redington Shores, River Ranch, Riverview, Rotonda West, Rubonia, Ruskin, Safety Harbor, St. James City, St. Petersburg, St. Petersburg Beach, Sanibel, Sarasota, Seffner, Seminole, Siesta Key, South Pasadena, Sun City Center, Sun City, Sydney, Tallevast, Tampa Palms, Tampa, Tarpon Springs, Temple Terrance, Terra Ceia, Terra Ceia Island, Thonotosassa, Tice, Tierra Verde, Town N Country, Trailer Estates, Treasure Island, University of South Florida, University of Tampa, University Park, Valrico, Venice, Wahneta, Waverly, Westchase, Wimauma, Winter Haven, and Ybor City.